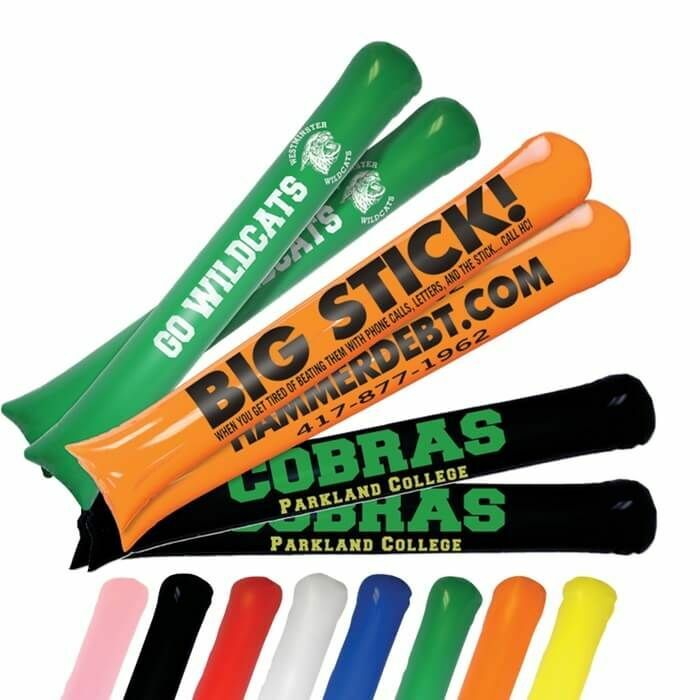 Re-inflatable and re-usable vinyl fan-ta-sticks noisemakers make events come alive when the two sticks are banged together. Do not inflate using air compressor. 1 pair = 2 personalized cheering sticks, so if you order a qty of 100, that means you will get a total of 200 custom cheering sticks. Production Time 5 business days. 48HR Rush Production - Only $15.00 per 100 pairs per side. (no proofs for rush orders). Production times are usually firm, but may vary depending on production schedules. Setup Charge $20.00 per ink/per color. I ordered these to sell at out upcoming high school football games. I was pleasantly surprised with the finished product. I will be definitely be placing a reorder soon! The cheer sticks are great! Customer Service was great, they kept in contact with me and made sure my order was correc and they work with me and delivered my sticks in record time. Exceptional Service on our Cheer Sticks! AHHH!!! They arrived and are perfect! Thank you for the exceptional service in handling our order!